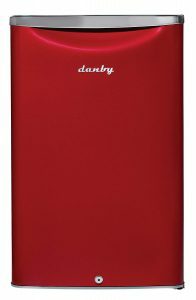 Danby DAR026 is a compact fridge that is part of Danby’s Contemporary Classic Collection, Essential Line. This patented design of Danby is offered in four sizes of 1.7 cu.ft. (DAR017), 2.6 cu.ft. (DAR026) , 3.3 cu.ft. (DAR033) and 4.4 cu.ft. (DAR044). The color options include black, white, red, silver, stainless steel and spotless steel. As one of the more popular compact fridges at Amazon.com they are rated an average of 4.2 out of 5 stars by 415 customers on the day of this review. And there are hundreds of questions and answers that you may have a look at on the product page. 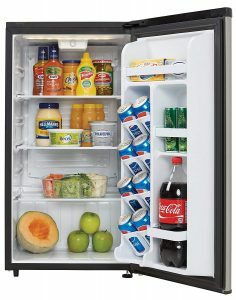 The 2.6 cubic feet capacity fridge is Energy Star compliant and will be easy on your energy bills. The white LED light in the white interior is turned on when you open the fridge door and lets you see the contents easier in the dark. Danby Compact Fridge comes with the proper built-in shelving on the door with also a tall bottle section and CanStor beverage dispensing system. The scratch resistant worktop is nice to have especially if you’re short on space. These four different size fridges have small differences like the Energy Star ratings for the smaller units and the glass shelves and door locks on the larger ones. Please have a look at the features of different models on the Amazon product page. The Danby DAR026A2BDB is easy on the eyes with a modern freestanding design weighs 55 pounds and measures 20.4 x 17.7 x 27 inches with a 2.6 cubic feet ( 73-liter) capacity. It is created as a stand alone fridge only and not as built-in under the counter as it will need at least 5 inches of space at the rear. It has an efficient R600a refrigerant compressor that does cycles occasionally but runs mostly quietly. It comes with the automatic defrost feature that regularly defrosts the evaporator in the fridge. The door hinge is reversible and you can set it up very easily with the instructions included to open it from the right or left depending on your space. It has a door handle at the top with a rubber grip and an ergonomic design. The smooth back design and matte black finish (or whichever color you choose) are quite nice. The classic retro curved door design is inspired from the middle of the 20th century style and simplicity- retro for the modern consumer. and has 2.5 tempered glass shelves to give you a decent amount of storage space. Some customers are using these fridges in their offices and quiet conference rooms and they do not interfere their meetings or conferences. Please note that none of the four models include a freezer and they are all fridges. So you may want to look at the alternative models through the Amazon product page if you prefer a fridge freezer. These fridges are designed for indoor use only and you’re not recommended to use it anywhere outdoors. It is not a good idea to remove the racks off the door as it will not be stable and you won’t be able to put anything on there. With an efficient and modern compressor the fridge cools down immediately and stays at the set cool temp consistently. The coils at the rear are hidden with a smooth metal plate without the functions being affected. It is mainly for snacks and beverages, rather than things like meat that could go off with small temperature fluctuations. But overall it is powerful, functional, sturdy, nice looking, quiet, compact, offers plenty of space and does the job by keeping your items cool.